This hyperbook, a stand-alone Web site, gives you enough of the savvy of the professional presenter to make their presentations terrific. Are your This item is available in downloadable format only. Since it isn't shipped, be sure before you order that your shipping charges are 0.organization's technical presentations dull, overly complex and off target? Organizations today use presentations both to deliver their messages to customers, conferences and trade shows, and to carry out internal development of both product and strategy. Although technical professionals bring technical mastery to these challenges, their presentation skills frequently limit their performance. This is a hyperbook packed with tips that show how to create terrific technical presentations. If you or the people in your organization make technical presentations, chances are good that they're doing it without training. Some are naturally good at it. A few have had presentation skills training, but even fewer have had training for technical presentations. Terrific Technical Presentations fills that gap. If a demonstration is involved, sometimes the equipment fails, or the product doesn't work properly. If the product is software, debugging alerts appear. Too often, we hear "Just ignore that." 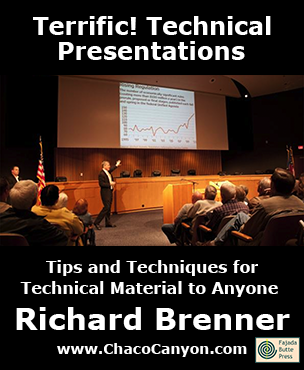 Terrific Technical Presentations is designed for technical professionals and their managers. It's ideal for anyone responsible for delivering technical material in settings such as customer calls, conferences, trade shows, or reviews. It's especially useful for people who deliver presentations to senior management. We're continuously improving the content of Terrific Technical Presentations. We distribute periodic updates, which you'll receive for one year. This item is also available at significant savings as part of a package of all my ebooks and tips booklets. Check it out!